Henry Conger Pratt was born at Fort Stanton, New Mexico, in 1882. He was appointed to the U.S. Military Academy, West Point, New York, from Wisconsin on August 1, 1900, and upon graduation June 15, 1904, was commissioned a second lieutenant of Cavalry, Regular Army. Philippine Islands, after which her served at Fort Snelling, Minnesota, until April 1909. He was aide to President Taft and assistant to the officer in charge of public buildings and grounds to December 1911, part of which time, from March to August 1911, he served at San Antonio, Texas, as aide to Major General W.H. Carter. He was aide to Major General Arthur Murray at Washington, D.C., to March 1912, and at the Presidio of San Francisco with the 1st Cavalry to May 1913, and then moved with the 1st Cavalry to the Presidio of Monterey, California, where he served until August 1914 except for a short tour in the Yosemite Valley, and at San Ysidro, California, to January 1915. He was again assigned to duty as aide to General Murray and served with him to December 1915, when he returned to duty with the 1st Cavalry at the Presidio of Monterey, California, where he served a brief tour of duty. He was aide to Brigadier General George Ball Jr., at San Antonio, Texas to May 1916, and then at El Paso, Texas, until March 1917. He was ordered to Hawaii in March 1917, and was assigned to duty with the 4th Cavalry at Schofield Barracks. He was transferred to the Signal Corps for duty with the aviation section in August 1917, and continued on duty with the 4th Cavalry until October 1917, when he returned to the United States that same month, and served at Kelly Field, Texas, until the following November. He was post adjutant, Call Field, Texas, to January 1918, and commanding officer, Brooks Field, Texas, to September 1918. He next served with the Division of Military Aeronautics at Washington, D.C., until October 1918, when he sailed to France where he was on temporary duty with the American Expeditionary Forces in connection with aviation until December 1918. Returning to the United States he became a member of the Board of Organization at Washington D.C., on which he served to January 1919. He commanded Kelly Field, Texas, for the next three months, part of which time he was assistant and acting executive. He attended the General Staff College, Washington, D.C., to June 1920, and was then assigned to duty as commanding officer, Kelly Field, Texas to September 1920. He was air officer, Eighth Corps Area, Fort Sam Houston, Texas, to April 1921, after which he attended the advanced bombing course at Kelly Field, Texas. After graduation in June 1921, he attended the School of the Line, Fort Leavenworth, Kansas, completing the course as a distinguished graduate in June 1922. He then attended the Command and General Staff School, Fort Leavenworth, Kansas, and graduated in June 1923, after which he enrolled in the Army War College, Washington, D.C. He graduated in June 1924, and became chief, Training and War Plans Division, Office of the Chief of the Air Corps, Washington, D.C., to May 1928; and commanding officer, Mitchel Field, New York, and 9th Observation Group to June 1929. He was ordered to Hawaii in July 1929, and upon his arrival served as Department Air Officer to July 1930. He then returned to the United States and was assigned to duty as chief, Materiel Division, Air Corps, and commandant, Engineering School, Wright Field, Ohio, to March 1935. In March 1935 he assumed command of the 2nd Wing, General Headquarters, Air Force, Langley Field, Virginia, until March 1937. His next assignment was as commandant of the Air Corps Tactical School, Maxwell, Alabama. In August 1938 he went to the Philippines where he assumed command of the 23rd Infantry Brigade at Fort William McKinley in October 1938, and in May 1940, he assumed command of the Philippine Division and the post of Fort William McKinley. He returned to the United States and was assigned to Headquarters Ninth Corps Area, Presidio of San Francisco, California, in October 1940, and in November 1940 was assigned to command the II Army Corps, with headquarters at Fort George G. Meade, Maryland. The headquarters of this command subsequently moved to Wilmington, Delaware. He became commanding general of the Third Corps Area, Baltimore, Maryland, in August 1941 and in January 1942 assumed command of the Trinidad Sector and base command of the Caribbean Defense Command. In March 1943 he became commanding general of the Puerto Rican Department. In July 1943 he was assigned to command the Antilles Department, which was a new organization embodying the Puerto Rican Department and the Trinidad Sector. In November 1943 he was assigned to Headquarters Third Service Command, Baltimore, Maryland, upon his return to the United States, and in January 1944 was named commanding general, Southern Defense Command, at Fort Sam Houston, Texas. The following October he was transferred and became commanding general of the Western Defense Command, Presidio of San Francisco, California. In December 1945 he was assigned to the Office of the Chief of Staff, Washington, D.C. He was awarded the Distinguished Service Medal in June 1943. He has also been awarded the Knight of the Order of the Crown of Italy in 1933, Order of the Liberator (Bolivia) - Venezuela (degree of grand officer): Order of the Southern Cross -Brazil (degree of grand officer). General Pratt retired from active duty in September 1946 and died on April 1, 1966. He was buried with full military honors in Section 3 of Arlington National Cemetery. 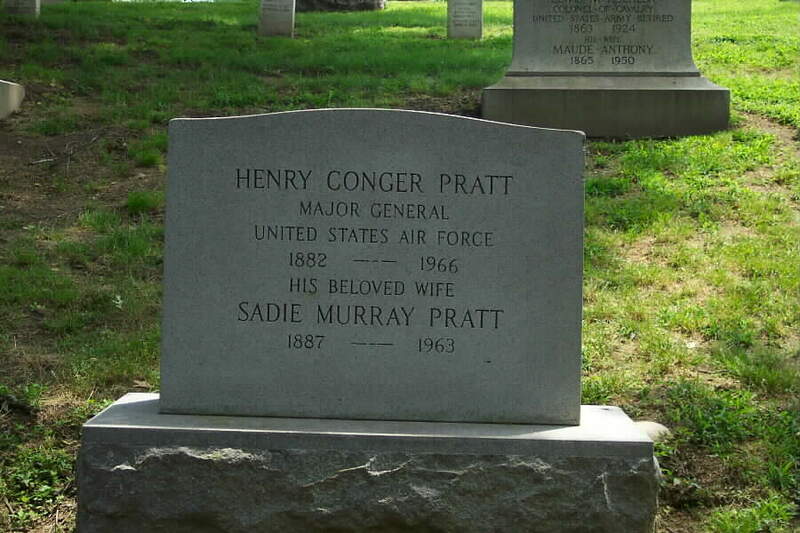 His wife, Sadie Murray Pratt (1887-1963) is buried with him. (1882-1966). Major General. USAAF, 1917-1946. Born 2 September 1882, Fort Stanton, NM. BS, United States Military Academy, 1904. Command and General Staff School, 1923; Army War College, 1924. Commissioned Second Lieutenant, Cavalry, June 1904 and served to grade of Captain, 1904-1917; began duty in Signal Corps, August 1917. Career assignments include: various duties as field grade officer, 1917-1924; Chief, Training and War Plans Division, Office of Air Corps, 1924-1928; Chief, Materiel Division and Commandant, Air Corps Engineering School, 1932-1935; Commanding General, 23rd Brigade, 1938-1940; Commanding General, Third Corps Area, 1941-1942; Commanding General, Trinidad Sector, The Antilles, 1942-1943; Commanding General, Antilles Department, 1943; Commanding General, Southern Defense Command, 1944; Commanding General, Western Defense Command, 1944-1945. Retired September 1946. Died 6 April 1966, Washington, DC. Personal papers relating to Pratt’s military career. Includes personal correspondence (1912-1958), scrapbooks (1919-1945) and photograph albums (1904-1946). WIFE OF HENRY C. PRATT M/GEN U. S. A. F.